Do you have a fig tree in your yard? Maybe you have noticed oddly shaped yellow blotches contrasting starkly with the otherwise normal green foliage. If so, the culprit most likely is fig mosaic virus, also referred to as fig tree mosaic. If you suspect the virus is the issue with your fig tree, it will be helpful to establish exactly what fig mosaic is. Fig tree mosaic is caused by several indeterminate viruses. 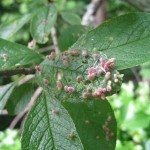 Recently, one virus, closteovirus or fig leaf mottle, has been associated with fig tree mosaic just as it is with almost all diseased fig trees. 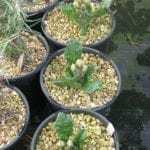 Fig tree virus is almost surely introduced into the plant via the eriophyid mite (Aceria fici) and additionally through vegetative cuttings and grafting. 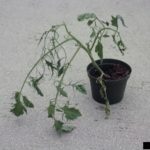 Fig mosaic virus does not discriminate, afflicting both leaves and fruit equally. 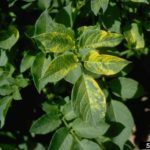 On foliage, as mentioned, the yellow mosaic spots are clearly visible and tend to bleed into the otherwise healthy green of the leaf. These lesions may be uniformly spaced over the leaf surface or splotched haphazardly across the leaf blade. Eventually, a rust colored band appears along the border of the mosaic lesion, which is a direct result of the death of epidermal or sub-epidermal cells. Fig mosaic lesions on fruit are similar in appearance although not quite as pronounced. The result in most cultivars of fig tree virus is premature fruit drop or minimal fruit production. Black Mission fig trees are more seriously damaged than its relations, Kadota and Calimyrna. Ficus palmata or trees engendered from seedlings having F. palmata as the male parent are immune to fig tree mosaic. So, how do we go about treating fig mosaic disease? There is good news and bad news, so let’s get the bad news out of the way. If your fig tree exhibits signs of fig tree mosaic, there are no chemical controls shown to be effective in treatment or extermination of this disease. Controlling the fig mites then, may be your only hope for treating fig mosaic disease. A variety of horticultural oils (crop oil, citrus oil, etc.) may be used to manage the infiltration of mites and, hence, aid in the cessation or at least progression of the disease. Ideally, prior to planting a fig tree, choose trees that show no signs of fig tree mosaic. Obviously, do not transplant or take cuttings from any fig trees that you suspect may be infected with mosaic.